Rand Paul visited Riley's Gun Shop in Hooksett on Tuesday- day one of a three day swing through New Hampshire that began with the speech at Politics and Eggs. "I don't think we should reward vulgarity. Vulgarity does not equate with insight. Because someone can stand up and say 'you're stupid and you're ugly' does not equate with a vision for the country," Paul said in his speech. That was a thinly veiled reference to Republican front runner Donald Trump. In an editorial Monday, Paul questioned how any conservatives could consider Trump, a "Clinton/Reid/Pelosi supporter who has openly professed that his views are those of a Democrat." "He was for the bank bailouts, for Obamacare, for a single-payer healthcare system, for the Democrats running the economy," Paul said. 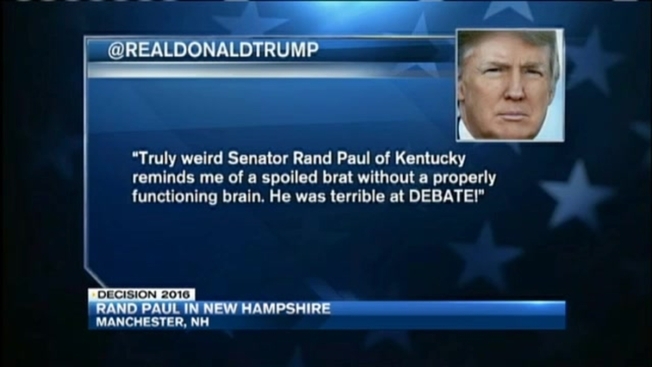 Poll: Post-Debate, Trump Still Leads GOP Field in N.H.
Trump shot back via Twitter with this response: "Truly weird Senator Rand Paul of Kentucky reminds me of a spoiled brat without a properly functioning brain. He was terrible at debate." "If were talking about who's a spoiled brat or not, my kids all work minimum-wage jobs. Do you think the Trump kids have been working at the local Pizza Hut? So, I live a pretty ordinary life and I'm not be grudging him his wealth but there's nothing about me or my family that's spoiled," Paul said in response. This latest back-and-forth with Donald Trump comes as poll numbers show Rand Paul losing some momentum. But Paul says, according to the polls he's looking at, he's not concerned. "It's not just about the horse race on the Republican side. It's about which candidate can beat Hillary Clinton. Right now in that last poll I was up two points. Donald Trump was down 10 points," Paul said. Paul says voters will ultimately get serious about the race and question if they want to reality TV star as their President.